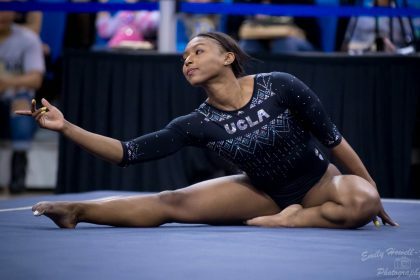 Welcome back to College Gym News for another preseason live blog! Just 25 days now until we can get rid of the word “preseason!” We can’t wait! 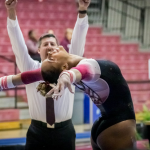 Tonight our mens editor, Brandis Heffner, has flipped over to the women’s side to preview this year’s LSU squad at its annual event, Gymnastics 101. You can watch along here and follow scores here. 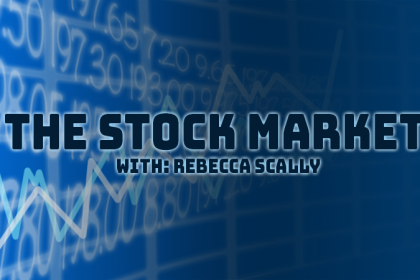 LSU expects to be contending for an NCAA title every year, and after finishing fourth last year, the Tigers will certainly be looking to improve upon that result. With the huge losses of Myia Hambrick and Erin Macadaeg, it will be no easy task moving up in the rankings this year. Not to say that LSU can’t, but it has some big routines to replace. 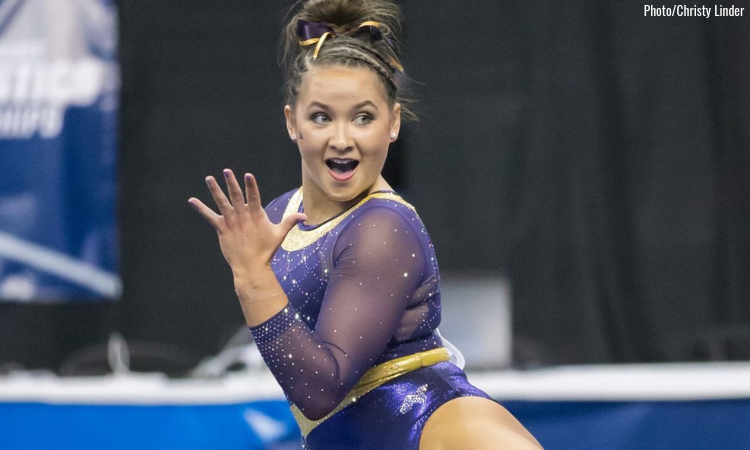 Coming in to this season I have two big questions for LSU: Who will step-up and replace the regular 9.9+ routines lost from Hambrick on every event, and what will we get from McKenna Kelley who is coming back from yet another injury? If Kelley can get back to top shape on vault and floor, that is an easy replacement for Hambrick’s routines on those events—but that still leaves spots open on bars and beam. With the addition of only two freshman to this year’s team, Rebecca D’Antonio and Bailey Ferrer, LSU will likely be relying on its veterans to add those events to their programs, especially with Ferrer not arriving on campus until January. Bridget Dean has been seen in videos training bars and has been in a few intrasquad beam lineups this season as well, so she is a possibility for both events. Beam also has a second open spot vacated by Macadaeg’s graduation, and finding another leadoff routine as reliable as hers will not be an easy task. I’ll be interested to see who LSU has filling those spots in their lineups today. This morning the preseason coaches poll was released and LSU is ranked fourth to begin the season, matching their finish at NCAA championships last April. Seems appropriate to me. The commentators are telling us that Jay Clark refers to Sarah Finnegan as the Michael Jordan of this team. Interesting. Scores not working currently. Hopefully we get that later. Cannamela: Starts off LSU strong with a high FTY. Just a small but controlled step forward. Harrold: 1.5 with a deep squat and step to the side on the landing. The usual vault we see from her at Gymnastics 101. Priessman: Another FTY. Good clean lines in the air and just a small hop back. Commentators say she’s training a 1.5. Edwards: Nice 1.5. Finished the twists super early and had a nice open position going for the landing. Just a hop forward. DD is saying only a .1 deduction for the landing. I agree. Finnegan: STUCK FTY. Just beautiful. Sky high and flared out at the end. Doesn’t get much better than that. Edney: 1.5 almost stuck. Small step forward. Solid start for the Tigers on vault. Once they get those landings it could be another strong year of vaults for LSU. No McKenna Kelley here today though and no mention of her prospects yet on the broadcast. The fulls in the lineup are good but they could use another 10.0 start, especially if Harrold can’t clean up her vault which she has struggled to do in the past. They’re showing a replay of Finnegan on vault and I am not disappointed at that. Her chest is so upright on the landing too. Easily a 9.95 in my book. WOW… @sfinnegan37 is in mid-season form! Durante: Joined part-way into her routine. Nice jager and pak. Looks like shes leading off again this year. Stuck FTDT dismount. Such a reliable leadoff. Dean: Her LSU debut I believe. Ray to start with a little flexed feet. Toe on to bail fine. DLO dismount and a small hop back. Solid set with just a bit of feet and knees to clean up before next month. Harrold: Jump to high bar to her signature Zuchold. Slight arch when catching the low bar. Beautiful jager. Double front dismount and a small step forward. Edney: Huge hindorff. Toe on to bail. Jumps to high bar. Winds up and over-rotates her DLO just a bit and takes a step back. Super nice position in the DLO and good distance on the catch of her Hindorff. Finnegan: Gorgeous Ray. Toe on to bail. Toe shoot up to the high bar. Stuck DLO but quite a bit piked on the first flip. Unreal toe point through the whole thing as usual. Assuming Priessman is back to her usual self on bars this isn’t a lineup I’d be worried about as an LSU fan. Dean isn’t going to bring in the scores that Hambrick did last year, but will bring in a solid enough score to help them go 49.4+ when everyone is hitting. The commentators are currently interviewing Clark about the bars lineup. Says they’re off to a slower start because they’re being precautionary. Expect some lineup changes from what we saw tonight. Desiderio: Front aerial to split jump. BHS LOSO solid. Smooth full turn. Switch leap to switch half to beat jump. Little short of 180 on the switch half. Cat leap to gainer full dismount with a step to the side and slightly chest down. Not quite Macadaeg status but a promising leadoff for LSU. 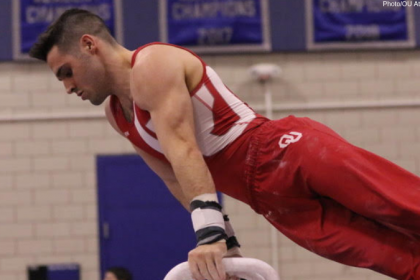 Clark continued to talk through that beam routine and said he makes them train with the bars on different settings to get used to performing on different sets of bars. Interesting strategy but it seems to be working with their improved bars over the past few years! Dean: Nice to see her crack this lineup as well. Nice full turn. Side aerial to BHS slight shuffle of the feet. Split leap to split side. Front aerial. Side aerial to layout full dismount small hop. Solid just a little nerves on the flight series and a little knees too. Durante: Front aerial to beat jump to a neat pose. I like it. BHS LOSO great form. Little bit of a long pause though according to Jay Clark who is still talking. Solid leap series. Good full turn. Side aerial to layout full dismount small hop back. Great to see Durante do something other than bars! Edney: Front aerial to split leap. BHS LOSO slight wobble but corrects quickly. Switch leap to split side. Full turn but we only got to see her feet… Front toss with a tiny lean to the side. Stuck RO 1.5 dismount. Just the slight adjustments but not much to work on with that routine. Jay Clark now talking about not having to recruit 8th graders anymore. Thank goodness. We’re happy too Jay. Campbell: Nice mount choreo. BHS LOSO super solid. Feet only view of full turn again. Front aerial to sissone. Switch leap to switch half nailed as Jay praises Kim Zmeskal’s coaching. RO double full dismount small hop. Great routine and looked very confident. Finnegan: Starts with a slightly wobbly wolf turn. Not her usual. BHS LOSO slight lean to the left. Switch leap to switch half with beautiful toe point. Side somi. Side aerial to layout full dismount and her first non-stick of the day. A little tentative for her but it’s Sarah Finnegan so its still better than most. Dean and Durante are both nice additions to this lineup. Durante has some beautiful form and could bring in some BIG scores for them on beam this year if she can handle the pressure like she did tonight. Lets hope she develops the same consistency on beam that she has on bars! Harrold: Front double full with a good landing. Double pike with a spot but didn’t need it. Controlled leap series. Some low key techno music going on. Last pass is a RO 1.5 to punch layout stuck beautifully. Easily her best event of the day. Desiderio: First pass is a high DLO. Good form too. Front tuck through to double back. Little low with the chest on the landing. Good leaps. Double pike to end with a big step back. Spotted on all the tumbling. Edwards: Playfull music. Front double full with just a crossover step on the landing. Double tuck second pass. Switch side to straddle full done well. RO 1.5 to punch layout super floaty. Very clean routine with little form deductions. Kelley: Her only event tonight but is training three events. Crowd very excited to see her. Opens with a DLO chest a tad low. Here’s the real techno music, Harrold was only the preview. RO 1.5 to punch layout solid landing. Nice tucked 1.5 jump in her leap series. Double tuck dismount with a hop back on the landing. Looks pretty good in her post-injury debut. Finnegan: I will never get over her RO 1.5 through to 2.5 opening pass. So beautiful. A little short on the landing and had to step back. Tad short on the double tuck landing too with a lunge forward. Ends with a double pike and her best landing of the routine. Edney: STUCK double arabian to open. RO 1.5 to punch layout and danced right out. Switch ring to tour jete half well controlled. Double tuck final pass and nearly hopped out of bounds but Jay was spotting and kept her in. Will be a great anchor routine for LSU this year. Interview with DD coming up after the commercial break. Floor was a hit for LSU and will contend with beam to be their best event this season judging by tonight. Most tumbling passes were spotted but didn’t need to be, nearly all the landings were solid which is quite impressive this early on. Glad to see Kelley back in the lineup as well. The crowd loves her and will help give them that home meet advantage. The commentators cannot get over LSU’s 12,000 person average home meet attendance. They’ve mentioned it at least five times. Yes, it is impressive but to us gymnerds thats the way it should be! DD states that she voted against the new postseason format a few years ago but says now it’s time for it. Says it’s better because it’s quicker and the fans understand it and can get more involved! I love it! Overall I say it was a successful night for the Tigers. We got to see the status of Kelley and it looks promising even though we didn’t get to see her on vault where she’s hopefully bringing a 10.0 start value. I’m most impressed with Sami Durante on beam. Her form was beautiful and I think right away she’ll be able to bring in those high scores they’re losing from Hambrick and Macadaeg. No doubt that LSU will be able to contend for an SEC title, and possibly the national title as well. But for that NCAA championship LSU is going to need to clean up on vault and bars and start rocking those beam landings. But no falls tonight! Thats always impressive at this point in the preseason. 1. You mention that Ferrer is not arriving on campus until January. She actually arrived on campus a few days before Gym 101 and was present at the event however the coaches did not have her perform due to still settling in and adjusting to life at LSU. I recall them saying they plan on putting her in the lineups for the leg events but she can compete in the AA. She has a 10.0 SV vault, training an Omelianchik vault. 2. Prior to injury, Kelley was training a front handspring pike half vault (The same one that Rachel Slocum of Florida and Hunter Price of OU competed) which I believe is a 10.0 SV vault. 3. I believe I remember hearing the coaches saying that Cannamela and Priessman are both training 10.0 SV vaults with a Y1.5. Also with regards to Priessman, she is also training on Floor and could potentially make the lineup in the postseason depending on her ankles and her shoulder. I’ve also heard that she has been training bars consistently at practice so I hope that when season comes around her shoulder will be as close to 100% ready to go as it can be.